The Kashmir region is show outlined in red. Click to see more details. Kashmir (Urdu: کشمیر, Kashmiri: کٔشِیر), also known as Cashmere, is a region in South-central Asia. Historically, the name Kashmir referred to the valley just to the south of the western end of the Himalayan mountain range. Today, Kashmir refers to a much larger area that includes the Indian state of Jammu and Kashmir (which includes the Kashmir Valley, Jammu region and Ladakh), Azad Kashmir and Gilgit–Baltistan (part of Pakistan), and Aksai Chin and the Trans-Karakoram Tract (part of China). The main "Valley of Kashmir" is a low fertile area surrounded by mountains and fed by many rivers. People like it for its natural beauty and simple lifestyle. The region is part of a border dispute between India and Pakistan. The economy of the region is focused on agriculture. People grow rice there. In the Indian part they also grow corn, such as wheat and barley. Its climate is different from that of most of the Indian subcontinent: It is milder. Therefore, crops like artichoke, cauliflower, cabbage and certain kinds of beans are also grown. Cashmere wool is well-known almost anywhere in the world. Cashmere wool is wool from Cashmere goats. Because of conflicts over the territory, however, most Cashmere wool no longer comes from Kashmir. Kashmir is home to the finest saffron in the world. Nanga Parbat, the 9th highest peak in the world and one of the most dangerous for climbers, is in the Northern Areas of the Kashmir Region, in Pakistan. A map of Kashmir showing the lines of control in more detail. Indian-controlled territory is yellow/light brown; Pakistan-controlled territory is green; China-controlled territory is darker brown. The triangle in White/Green/Yellow is the Siachen glacier, controlled by India. The Kashmir conflict has existed since India and Pakistan became independent states. At first, the Maharaja of Jammu and Kashmir, Hari Singh, wanted his state to remain independent of both India and Pakistan. On 20 October 1947, tribesmen supported by Pakistan invaded Kashmir. Singh fought back at first, but on 27 October, he asked the Governor-General of India, Louis Mountbatten, for help. He agreed, but made Singh turn over Jammu and Kashmir to India. Once the papers of accession to India were signed, Indian soldiers entered Kashmir with orders to stop any further occupation, but they were not allowed to expel anyone from the state. India took the matter to the United Nations. The UN resolution asked Pakistan to vacate the areas it had occupied and asked India to assist the U.N. Plebiscite Commission to organize a plebiscite to determine the will of the people. Pakistan refused to vacate the occupied areas and the plebiscite was never held. The Republic of India controls the state of Jammu and Kashmir. It is made of the Jammu region, the Kashmir valley, and Ladakh. Pakistan refers to this as Indian-occupied Kashmir, Indian-controlled Kashmir, Indian-annexed Kashmir, or Indian-held Kashmir. The territories known as Northern Areas and Azad Jammu and Kashmir are administered by Pakistan. The government of Pakistan calls them Pakistan-administered Kashmir. India refers to this as Pakistan-occupied Kashmir. The region called Aksai Chin is controlled by China. The Trans-Karakoram Tract is an area Pakistan gave to China on 3 March 1963. Pakistan says the area was uninhabited, so there is no problem to this. India claims the swap was illegal and that the area is part of its state Jammu and Kashmir. The Siachen Glacier is currently a disputed territory. India controls the glacier, and Pakistan controls the valley below. Red dotted line is AGPL, to the right of which is the Siachen Glacier, controlled by the Indian army. India and Pakistan have fought several wars over Kashmir. In 1949 and 1972 they agreed on a border for most of the Territories (except for the Siachen Glacier). This demarcation line which marks the border between India and Pakistan is known as the Line of Control. It is guarded by Indian and Pakistani troops. The border between Aksai Chin, held by China, and Jammu and Kashmir, held by India is known as Line of Actual Control. The Kashmir border between the Punjab (Pakistan) and Indian-administered Kashmir is called the Working boundary, but is not recognised by Pakistan. India has built a fence along part of this border. The Siachen Glacier and the bordering Saltoro Range first saw military action in 1984 when the Indian Army occupied the glacier and the Saltoro range to prevent Pakistan from occupying the area. This operation was codenamed Operation Meghdoot. There have been several minor changes to the held positions. However, the Indian Armed forces have held onto the heights on the plateau, preventing the Pakistani soldiers from climbing up the Saltoro range. Another reason behind the dispute over Kashmir is water. Many rivers start in Kashmir. Some of them are tributaries of the Indus River basin, such as the Jhelum and Chenab River. These flow into Pakistan and are used for irrigation there. Other rivers like the Ravi, Beas River and the Sutlej flow into northern India. One of the origins of the conflict is that with the Boundary Award of 1947, many of the Pakistani irrigation systems can be controlled from India. Pakistan has been afraid that India could stop the flow of rivers that start in Indian-controlled Kashmir and flow into Pakistan. This would harm the agrarian economy of Pakistan. The Indus Waters Treaty signed in 1960 resolved most of these disputes over the sharing of water. The treaty has not been fully followed: India has since constructed dams which limit the flow of water to the Pakistani side. As with other disputed territories, each government issues maps depicting their claims in Kashmir as part of their territory, regardless of actual control. It is illegal in India to exclude all or part of Kashmir in a map. It is also illegal in Pakistan not to include the state of Jammu and Kashmir as disputed territory, as permitted by the UN. Non-participants often use the Line of Control and the Line of Actual Control as the depicted boundaries, as is done in the CIA World Factbook, and the region is often marked out in hashmarks, although the Indian government strictly opposes such practices. When Microsoft released a map in Windows 95 and MapPoint 2002, a controversy was raised because it did not show all of Kashmir as part of India as per Indian claim. However, all the neutral and Pakistani companies claim to follow the UN's map and over 90% of all maps containing the territory of Kashmir show it as disputed territory. UN: The boundaries and names shown and the designations used on the map do not imply official endorsement or acceptance by the United Nations. Islamabad: The Government of Pakistan maintains un-provisionally and unconditionally that the informal "Accession of Jammu and Kashmir" to Pakistan or even to the Republic of India remains to be decided by UN plebiscite. It accepts the UN's map of the territory. 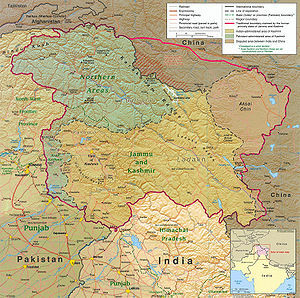 It also states that the designations and the presentation on the Kashmir regional map based on UN practice do not imply the expression of any opinion whatsoever on the part of the Commonwealth Secretariat or the publishers concerning the legal status of any country, territory or area, or of its authorities, or concerning the delimitation of its frontiers or boundaries. There is no intention to define the status of Jammu and Kashmir, which has not yet been agreed upon by the parties. It further says that boundaries must be based on the religious, cultural, racial, historical, geographical orientations of the people and not by politics. However it claims that this is not an endorsement of territorial claims by either side in the dispute. New Delhi: The Government of India states that "the external artificial boundaries of the Republic of India, especially concerning the international borders under its jurisdiction created by a foreign body are neither correct nor authenticated". China did not accept the boundaries of the princely state of Kashmir and Jammu, north of the Aksai Chin and the Karakoram that were proposed by the British. China settled its border disputes with Pakistan in the Trans-Karakoram Tract in 1963 with the provision that the settlement was subject to the final solution of the Kashmir dispute. Pakistan also agrees that it is part of China, but the exact border has not been agreed on. ↑ "Manning the Siachen Glacier". Bharat Rakshak Monitor. 2003. http://www.bharat-rakshak.com/MONITOR/ISSUE6-1/Siachen.html. Retrieved 2011=01-27. ↑ "Kashmir (region, Indian subcontinent) :: The Kashmir problem". Encyclopædia Britannica. http://www.britannica.com/EBchecked/topic/312908/Kashmir/214223/The-Kashmir-problem#ref673547. Retrieved 2 February 2010. ↑ "Factbox: all about India, China's border dispute". IBN Live. 8 November 2009. http://ibnlive.in.com/news/factbox-all-about-india-chinas-border-dispute/104799-3.html. Retrieved 13 April 2010. 1 Only recognized by Turkey; see Cyprus dispute. 2 Self-ruled Palestinian territories3 Disputed territories. 4 Status disputed with Morocco. This page was last changed on 20 December 2014, at 17:31.